Half a century ago, it was still fairly common to come upon native Americans - alone or in small groups - afoot along some local byway, treading the same paths trod by their ancient ancestors down through time. Each spring, for countless springtimes past, the Washo tribe had made its way from winter encampments in the Carson Valley up over the high passes into their summer ranges on the west shore of Tahoe's "Big Water." However, with the arrival of European types on the local scene, the lives of the Indians were inalterably marked for change. By the Mid-1930s, the west shore establishments of that era - Hotel Homewood, Chambers' Lodge, Meeks Bay Resort and Fallen Leaf Lodge - still carried out their symbiotic relations with the stragglers of these groups, providing food, old clothes and other cast-offs to their resident Indians in exchange for laundry and kitchen services rendered by the squaws of the party. Residents of the Washo campoodies situated in the meadow lands and canyons west of these resorts had by that time come to depend on resort-provided gratuities as a major aspect of theirexistence, abandoning the old ways in favor of three squares a day and a warm wrap to ward off the chill of a Carson Valley winter. A generation before, the cuisine in these encampments had still featured the pine nut as its staple ingredient, and the gathering, gleaning and prepar ation of this commodity was the basis of daily life during the summer months. The laborious process of refining these stubborns nuts into an edible state required the action of stone on stone, and this commodity was nearby in ample supply in the form of granite boulders. Natural depressions in such rocks were worn smoother and deeper each season by the ceaseless grinding of smaller stones against the hollows, pulverizing the tenacious morsels to a malable mash. Over time these shallow basins became veritable craters, some more than a hand's breadth deep and wide. As work forms the basis of communal existence, these grinding rocks were the center of tribal society. At such a rock, the women of the tribe would gather during the day to perform theirwork, each at herown station on the rock. The sense of community attendant on these gatherings has been described by Ranger Jim Stewart of Sugar Pine Point State Park, who discovered a marvelous example of an Indian grinding rock near the Park's campground. Though vegetation at the site now obscures the sense of the ancient scene, Stewart notes that the rock, at which as many as half-a-dozen squaws once sat working of an afternoon,actually overlooks a meadow area. Here, Washo youngsters must once have frolicked under their mothers' watchful attention,while the business of the camp went on amid exchanges of gossip from the group of assembled women. Stewart has also discovered a large grinding rock underwater just offshore of the Park's Ehrman Mansion, a location which suggests that the lake's nineteenth century elevations were low enough to allow the Washo grinders to use this alternate shoreline site as well. Another perennial Indian encampment, located on the banks of the Lake Outlet in Tahoe City, proved to be the site of another Indian grinding rock, revealed by the low water of 1924. Discovered by Constable Robert Montgomery Watson just offshore of the Gatekeeper's Cabin, this three-hole rock was moved to the Watson cabin on the bluff above Commons Beach (now the Watson Cabin Museum). 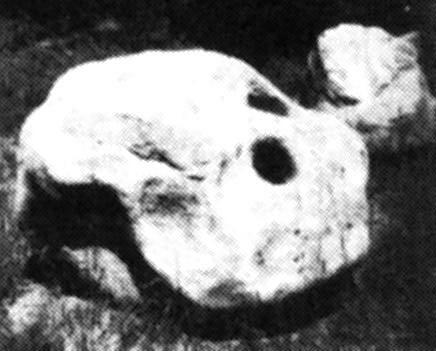 In later years, the rock was moved again by Watson's relatives, this time to the family's old mill property in Lake Forest, where it can still be found today. Along the Truckee River corridor, between Squaw Valley and Truckee, the presence of a two-hole rock suggests that this may have been a stop on the long trail from Carson Valley to the Lake. Obviously disturbed from its original position, the rock now seems to gaze skyward, as if searching the heavens for its former companions. Cal-Neva Point is the location of a sizable egg-shaped boulder in which is worn a single hole. High on the sloping hillside, in full view of the Lake beyond, this rock's situation afforded its grinder early knowledge of any approaching enemy, be it bear or bad weather. At nearby Brockway Hot Springs, another such rock, just above the current high water level, evidences the presence of an encampment on the present grounds of-the condominiums project. The coarse meal produced by this grinding process was used in a variety of ways, including a crude cake and a delicacy known as pine nut soup, the preparation of which was liberally described in a 1930s issue of the Tahoe Tattler. And though the Feast Days of the Washo for which these dishes were prepared are no longer celebrated on Tahoe's west shore, the rocks which played such an important role in their preparation remain behind to remind us of what is gone. PHOTO: "This grinding rock, discovered along the Truckee River, must have provided a workbench for Washo squaws."